For our next Society outing we popped down to Reading on the Saturday to lend a hand and have a look round. 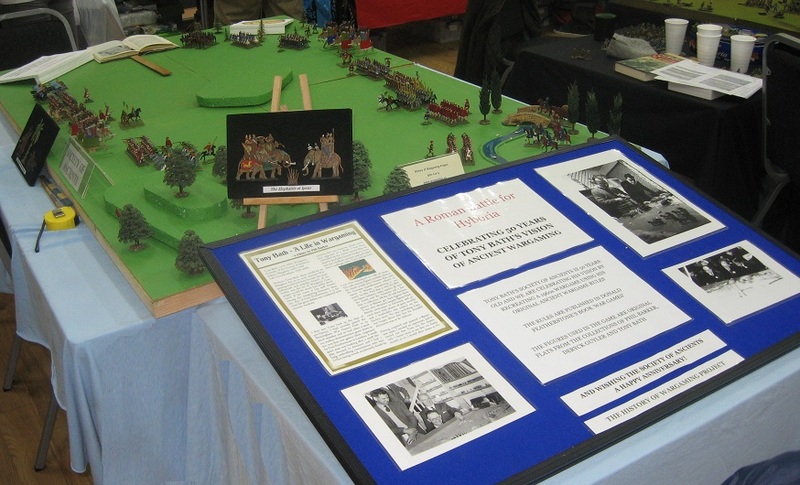 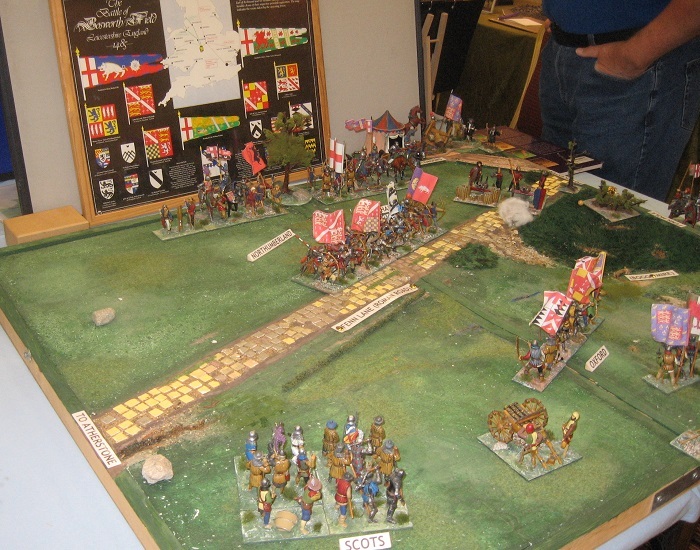 Richard was doing the stand and presenting a 'Lap of the Gods' treatment of the Battle of Tewkesbury which seemed to go down very well. I had a bit of time to play but there weren't as many Participation Games as you would have liked. The Bring & Buy was excellent ... very well supported and continuously busy all day. Almost too much stuff to browse it all but I got a couple of out-of-print books in mint condition for a good price so worth the effort. Parking was free but you had to be early I've heard ... Good on Warfare. 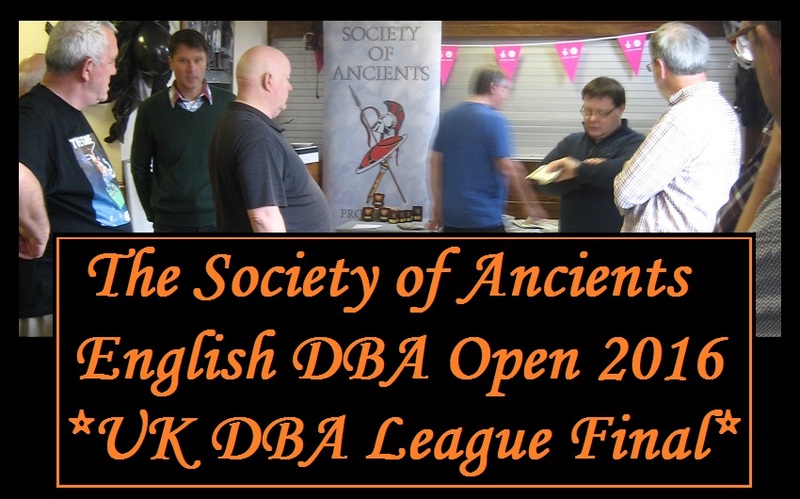 The final round of this year's DBA tour was, once again, in sunny Portsmouth, and many of the contenders were present with some placings still to be decided. 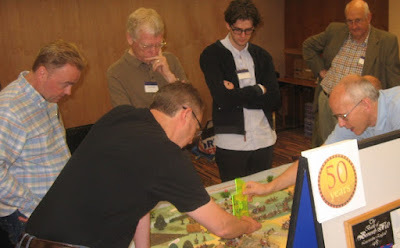 I went along for the games and to help with the presentations (I was, of course, not in contention - it is a long season and I can get to very few of the rounds). Players get to pick in order of qualifying, and select their option for the 2 remaining games. 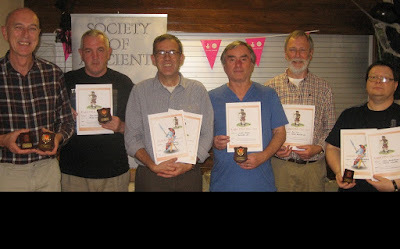 That left the overal standings: 1st and UK DBA League Champion: Martin Myers, League Runner Up: Colin O'Shea, 3rd: Bill MacGillivray, 4th: Richard Pulley, 5th: Arnaud Marmier, 6th Lindon Paxton followed by Pete Duckworth, Neil Mason, Martin Smith and Mark Johnson down to a total of 57 players altogether ... Tamara Fordham was 28th and won the Junior trophy. 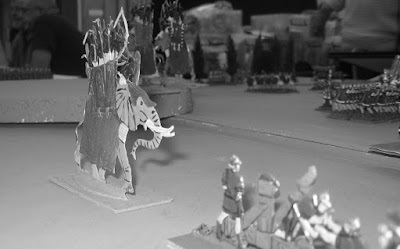 For the event I have recycled some Abyssinian foot from my old DBM army but having played 6 games on the day, I'm happy this is a good addition to my collection of bespoke armies and will tailor make the requisite troops. Look out for a future post. The general is a Cv element but I have put him on a camel to stand out. The cavalry are an imaginative mix of various components to give that desert frontier feel. 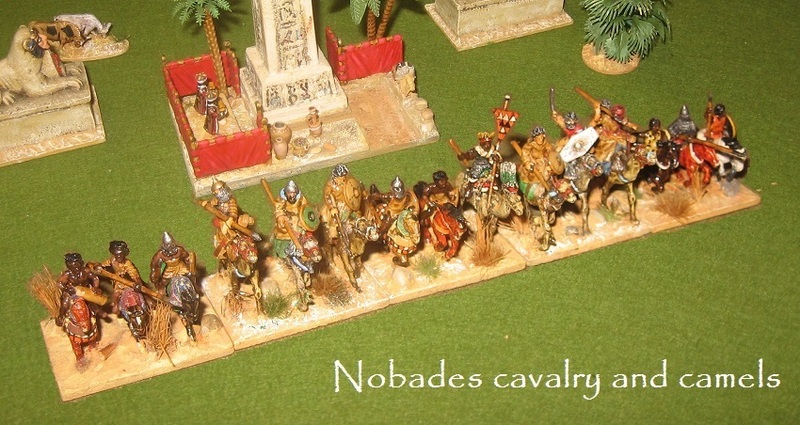 I have a large resource of African and Arab infantry and cavalry from that very large DBM army and should be able to populate all these armies with characteristic figures. 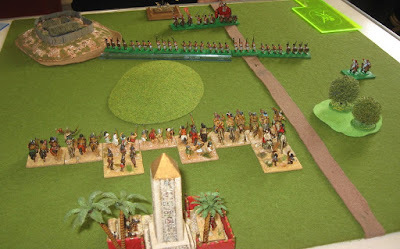 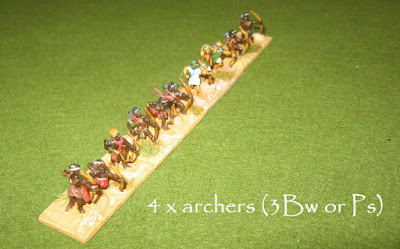 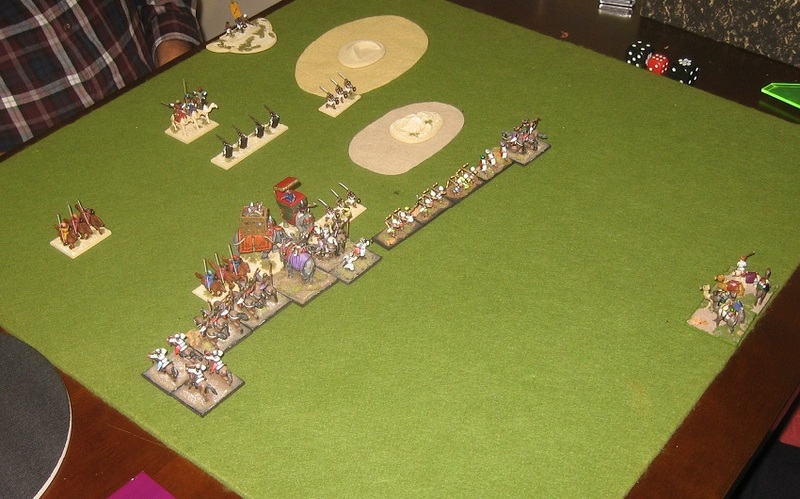 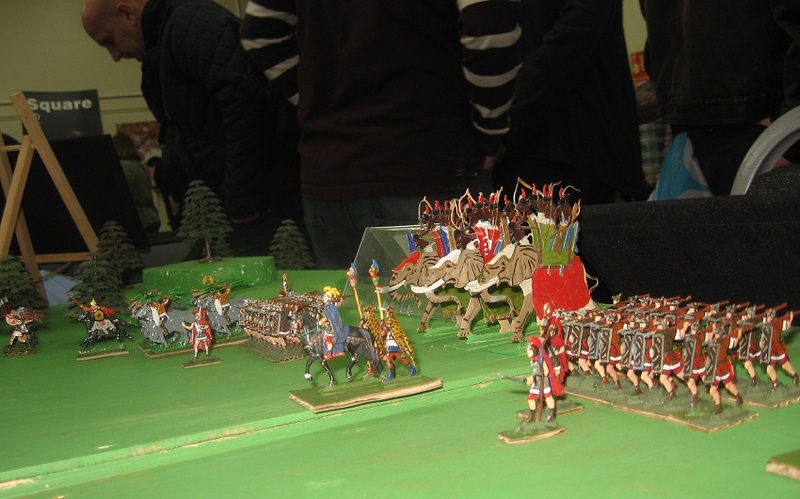 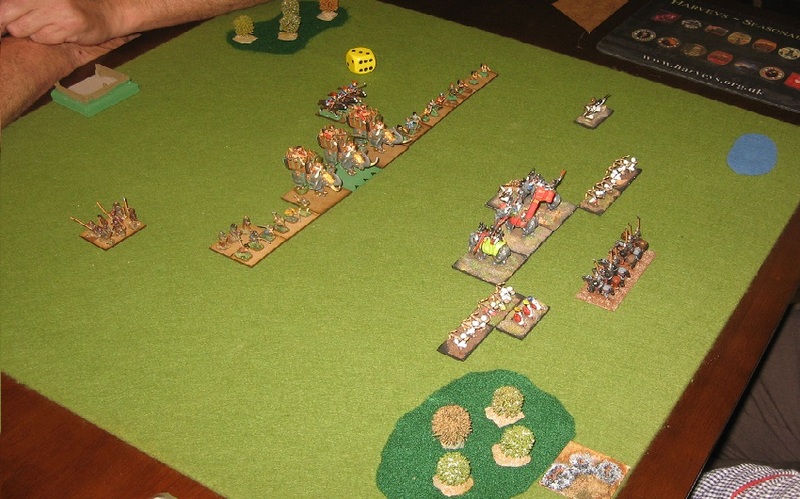 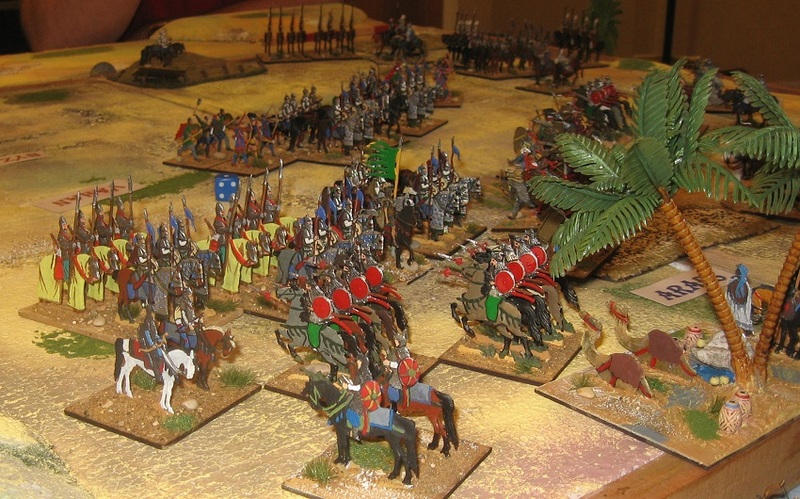 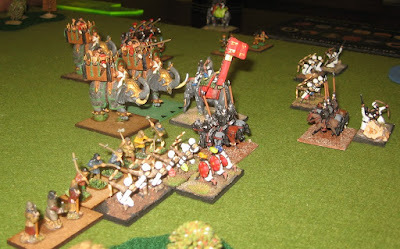 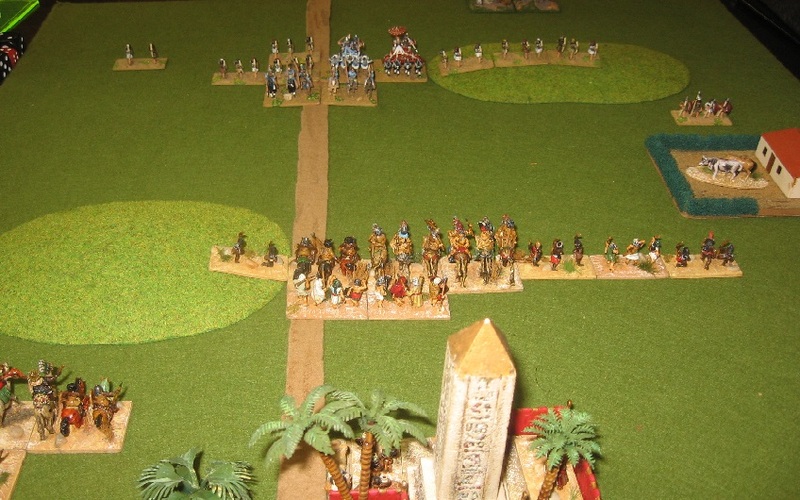 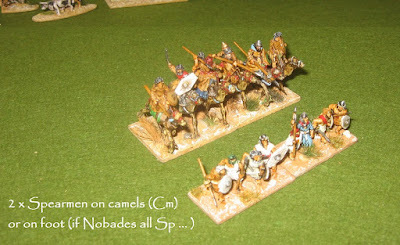 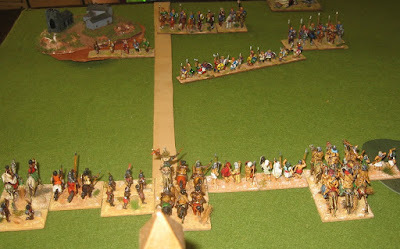 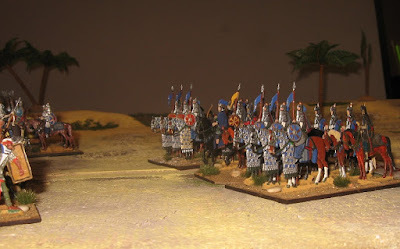 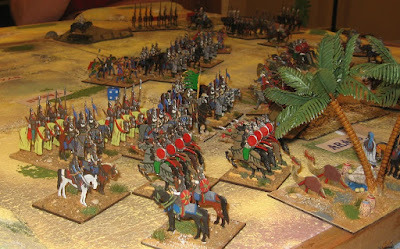 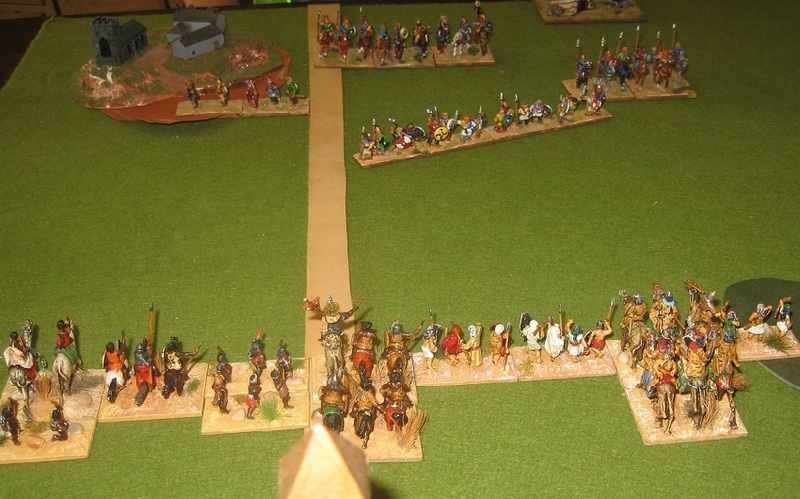 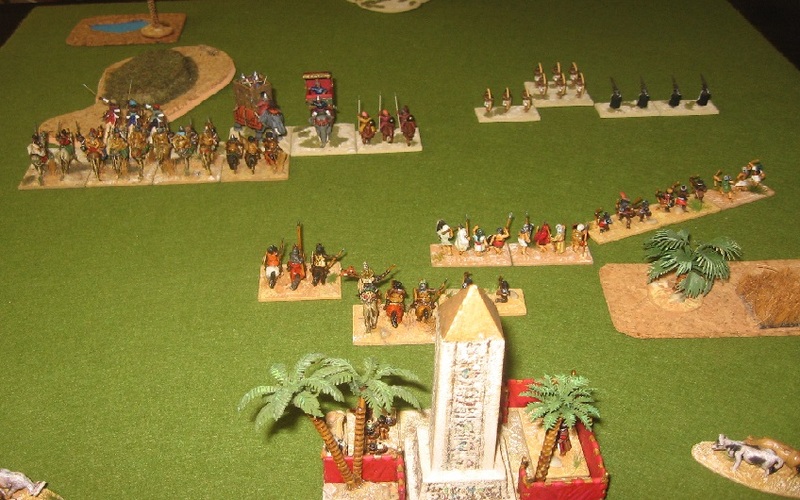 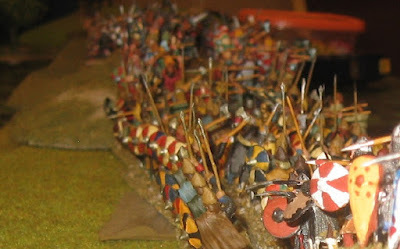 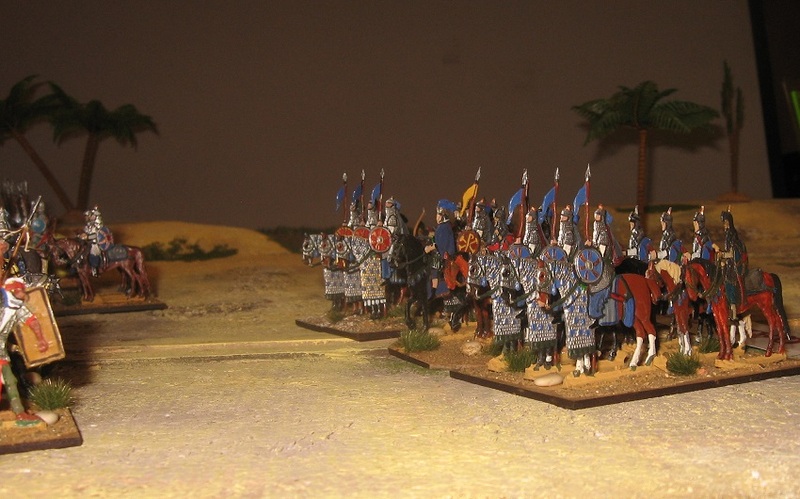 I favour taking the 2 camel mounted spearmen as the 'quick kill' against knights does give the army some deadly tricks. 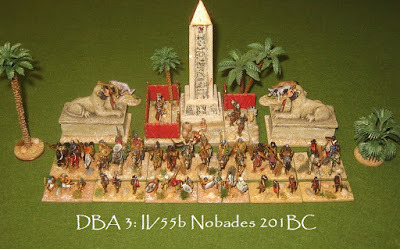 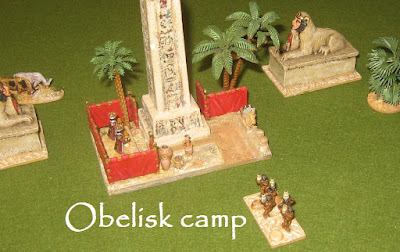 For the camp and table ornaments I assumed the Nobades had struck deep into the heartlands of the older Egyptian civilisations ... it's a nice setting. 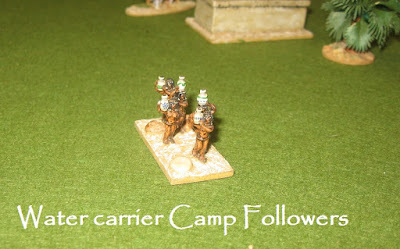 The lovely water carriers are Chariot. 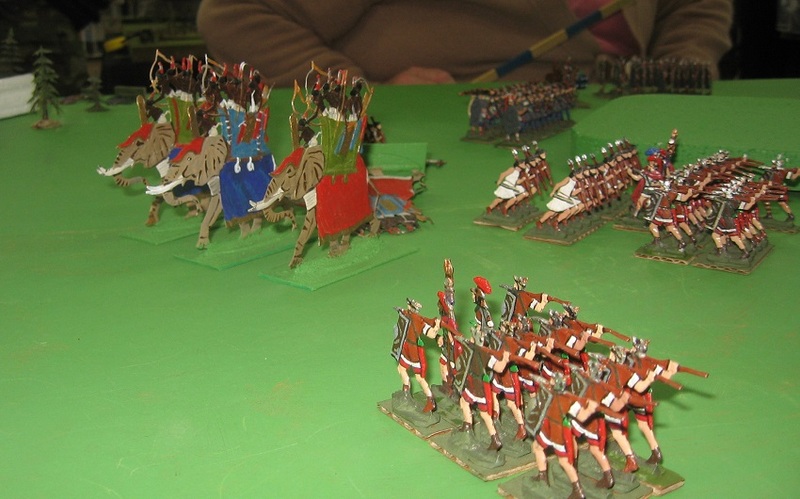 Otherwise it's a healthy mix of Museum, Essex, Falcon, Donnington, Gladiator, Chariot etc. 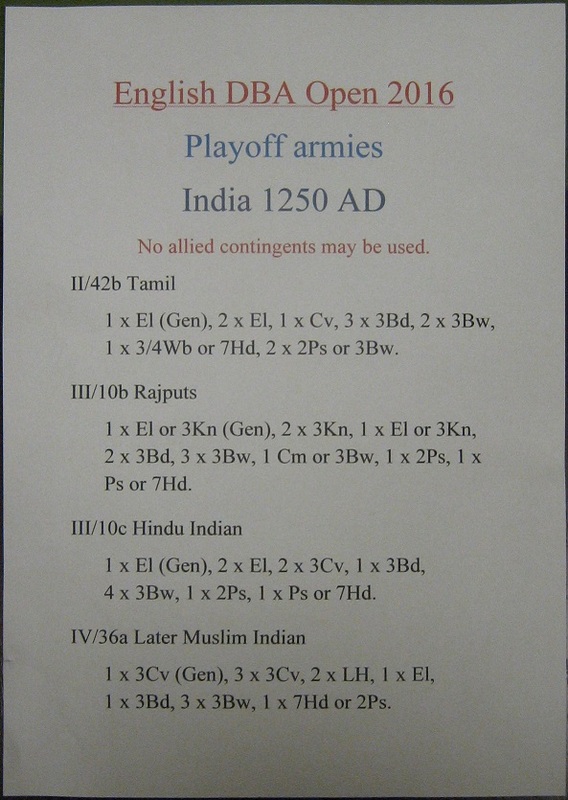 I'm sure you can spot the various examples. 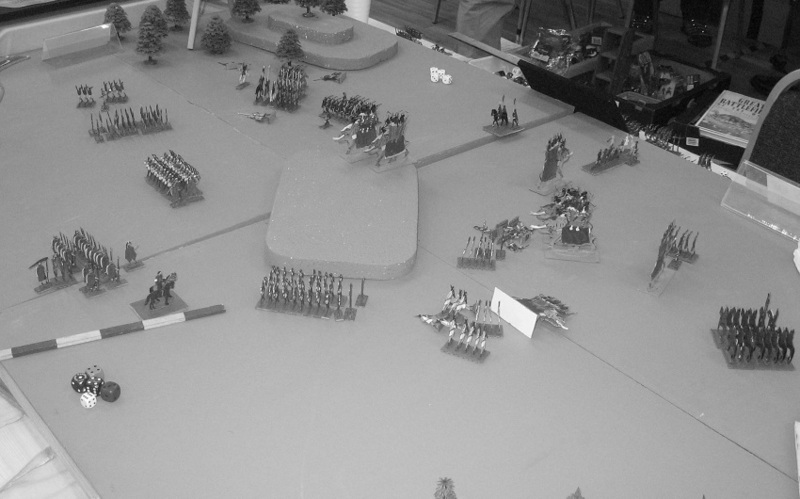 A report on the Open will follow shortly. 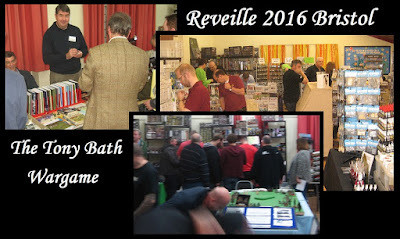 Hopefully the first of a new run - the first of many. Very pleasing to me to see the return of the Conference ... part of the lively SoA mix in the 1990s I was, unfortunately, the Committee member back then who had to cancel the last of them (SoAC VII, I think ... maybe VIII) due to price hikes at our traditional venue. 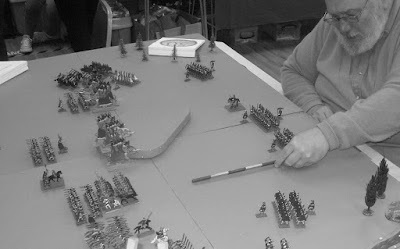 The cancellation was only ever meant to be temporary but the old style Committee was always reluctant to underwrite what it thought was a minority interest, so getting it back up and running was daunting. 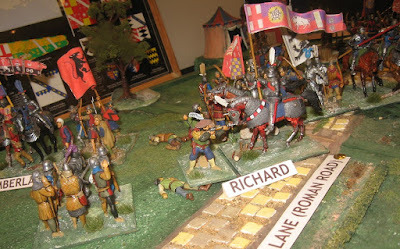 So a big thank you to Richard L for getting it to happen. 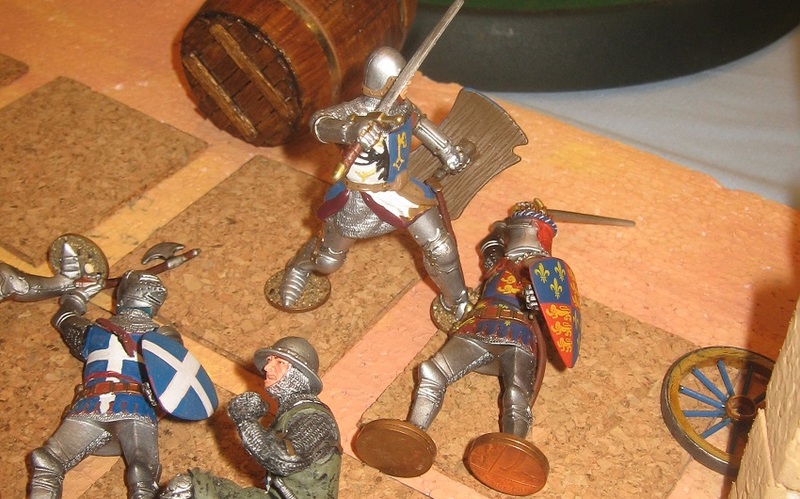 I'll doubtless do some features, and Slingshot will, I am sure, have some games, articles and scenarios - so this will just be a round-up that doesn't steal all the thunder. Around 4 talks and 8 or so games sessions (usually with 3 or 4 games to choose from in each slot), an annual dinner and lots of social mingling/bar time. Few ADGs, very little workshopping ... nothing outdoors ... a big Tactica session that ran all weekend. 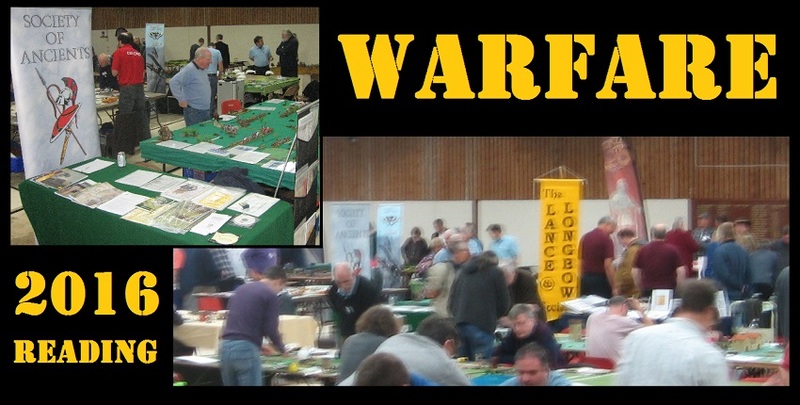 So somewhere between a 'wargames holiday' weekend and CoW. 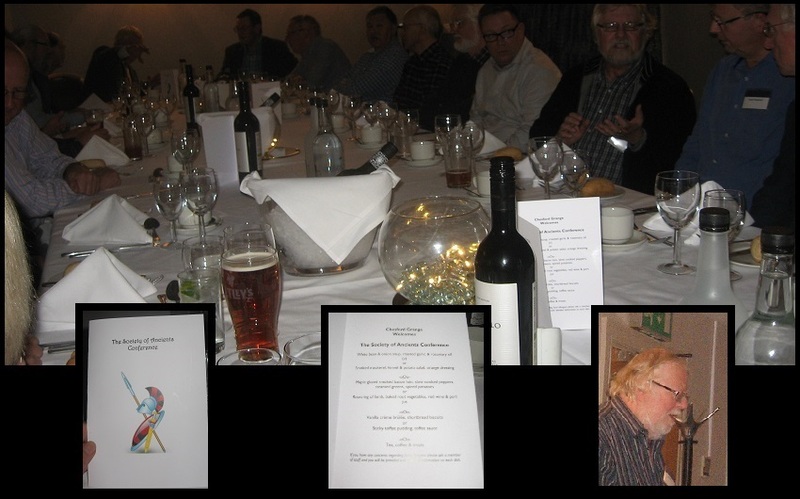 The dinner was excellent - nice to sit down together at the end of a full Saturday ... the food was very good and the speech by SoA veteran Will Whyler reflecting on the last 50 years was bearable (actually very good ;) but Will is a long-standing friend and you wouldn't want me to go over the top). 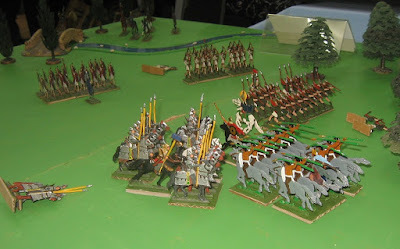 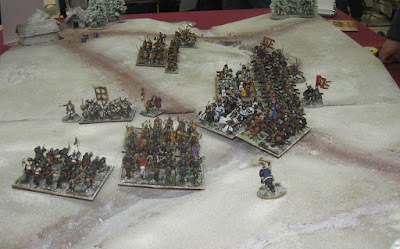 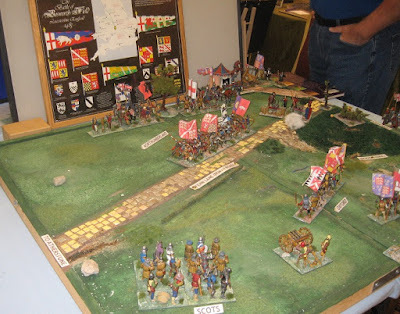 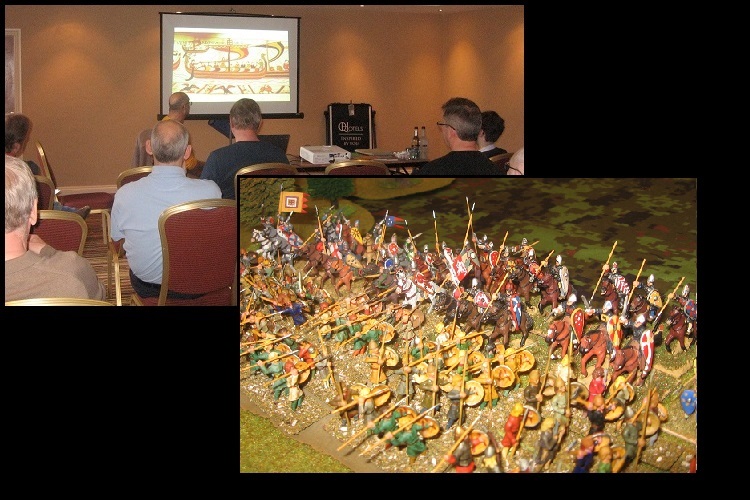 Saturday: Bosworth and Bouvines - 2 medieval battle compared; Sunday: Yarmuk - a DBA GBOH scenario explained and run. 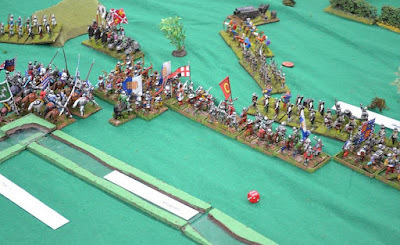 In this play through, Ferdinand count of Flanders very nearly pushed up to the bridge but ran out of supporting troops - eventually succumbing (captured on the field of battle as his historical antecedent) ... 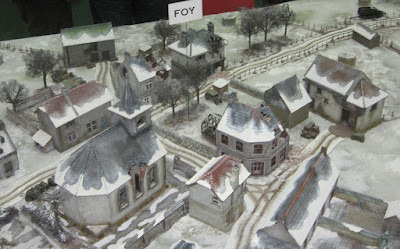 Elsewhere it was an attritional battle in which the allies could make little headway. 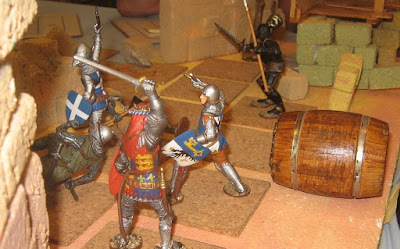 Bosworth, of course, was fought on very different lines to Bouvines ... the combat being more deadly and the traditions of chivalry being no barrier to the political benefits of killing your enemies on the battlefield. 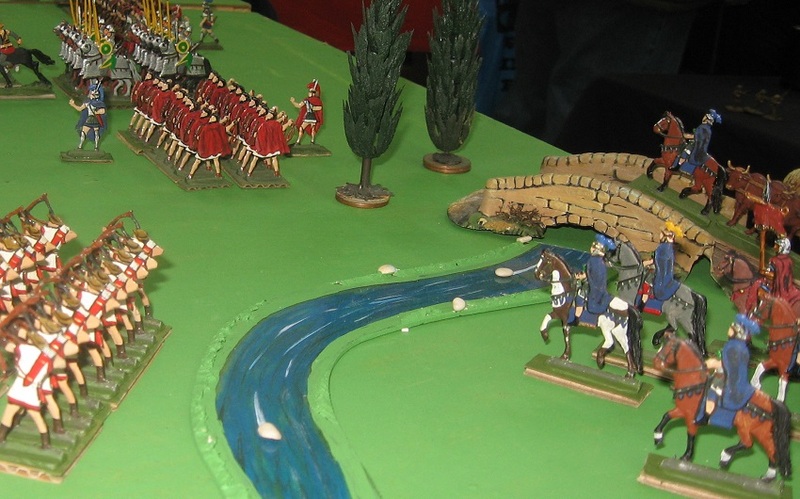 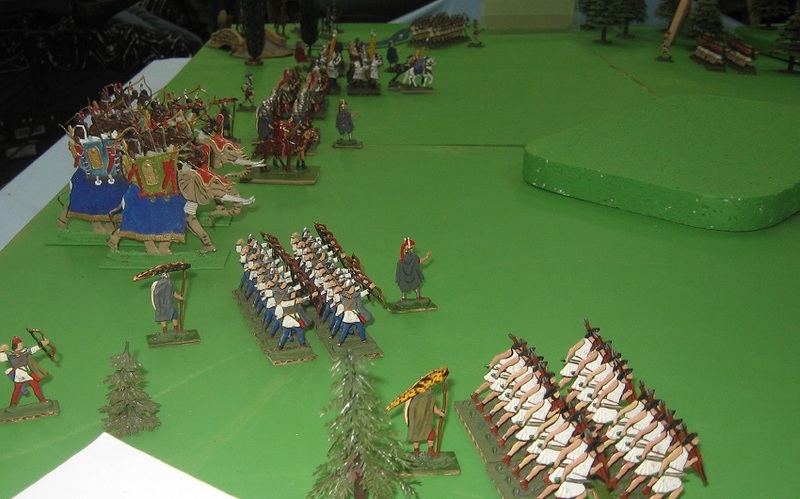 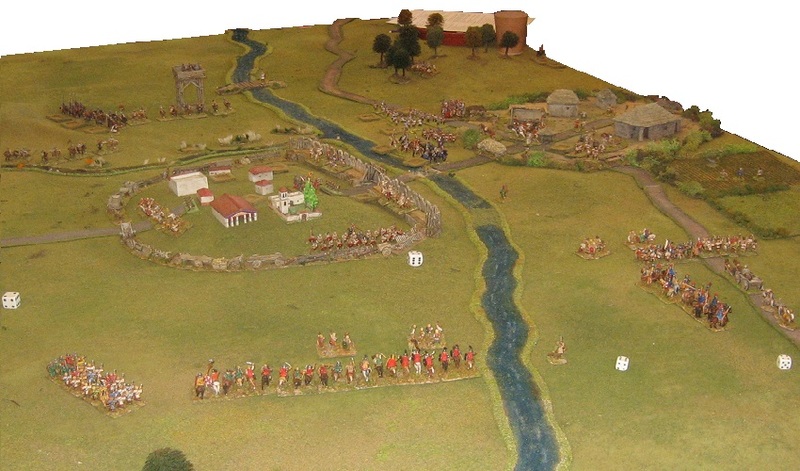 Richard narrowly lost this battle having dashed amongst the vanguards on a 'death ride' that took him from the marshy end of Fenn Lane and the likely Stanley trap. It gave us food for thought. 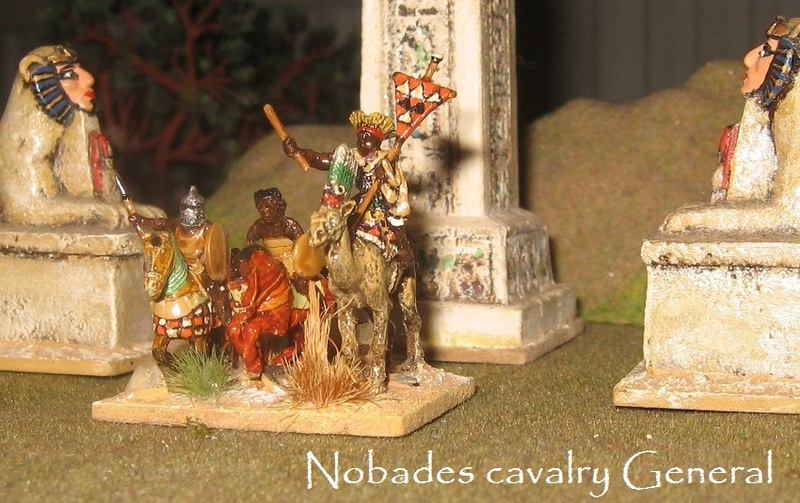 I think it vindicates the modern interpretation, however. 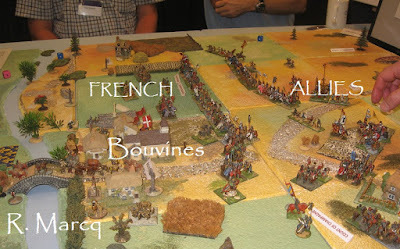 I played all these battles with DBA despite having run Bouvines with Armati and Basic Impetus previously. 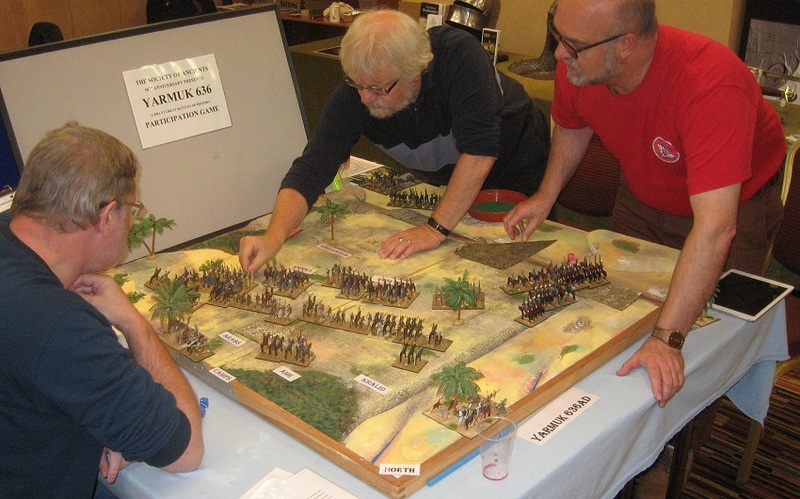 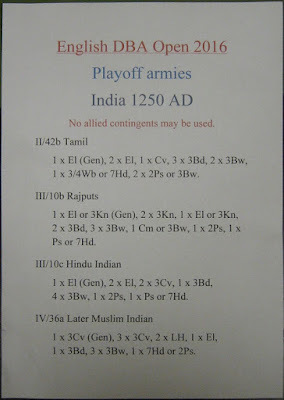 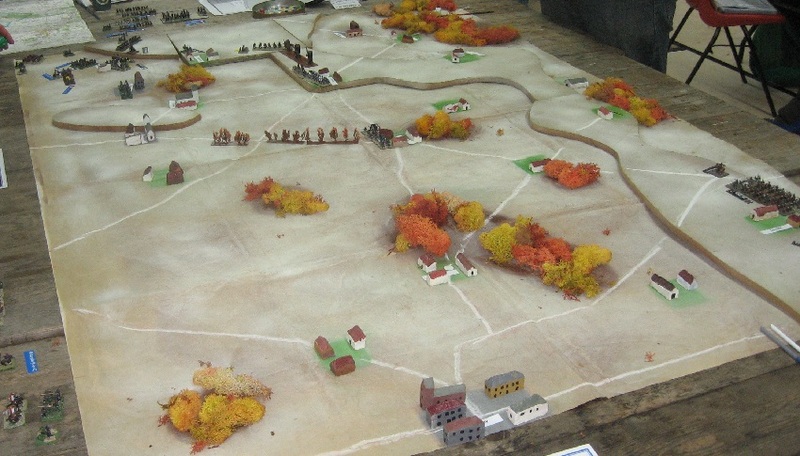 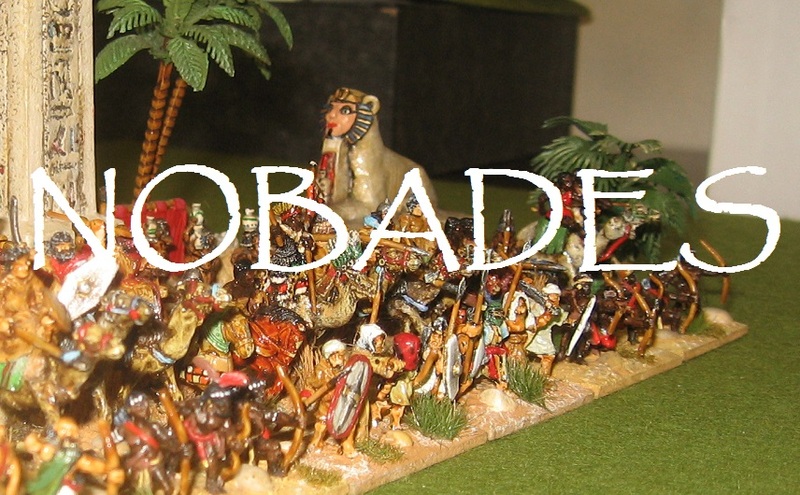 I decided that my theme of translating long-lost batles into playable wargames was best illustrated by using a common platform, rather than asking players to switch horses game-to-game. 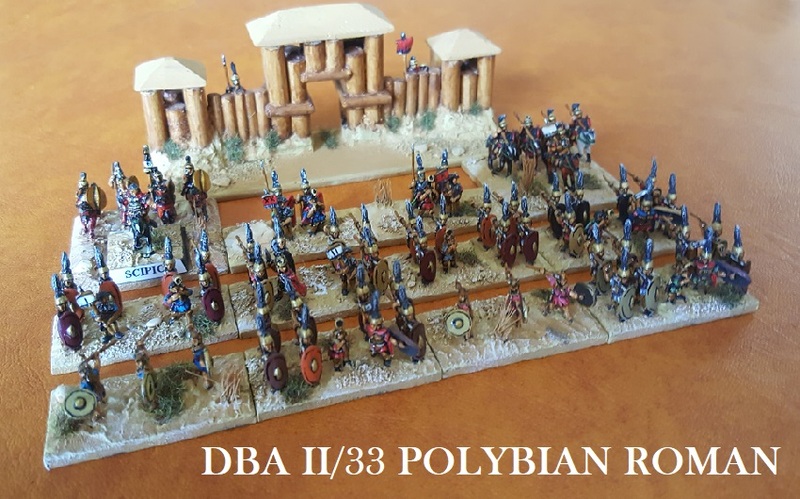 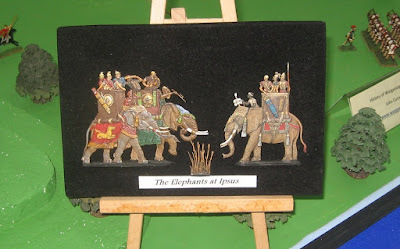 The third battle I looked at was Yarmuk ... this was my main contribution to The Great Battles of History project by the DBA contributor group. 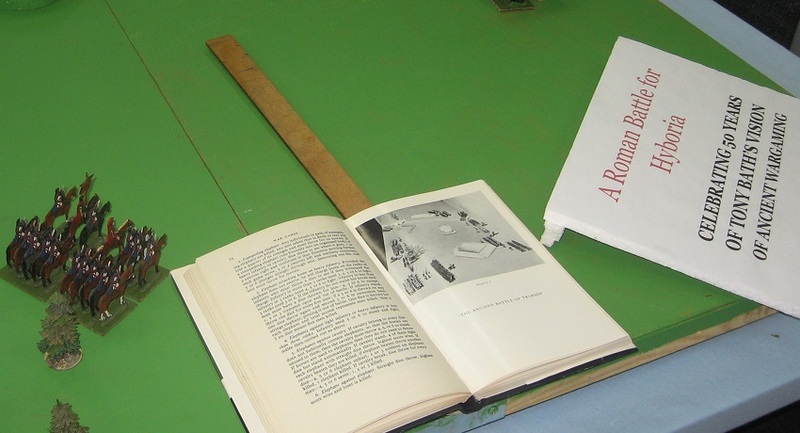 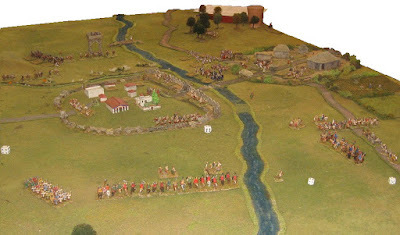 It features original flats from the collection of DBA author Phil Barker - the ancients collection he once used with Tony Bath and friends in the 'pee-history' of the modern game. 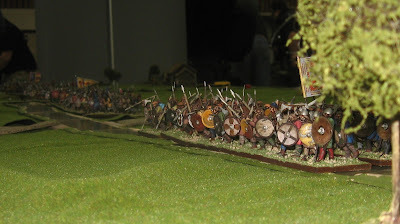 I have to say I still think they look splendid. 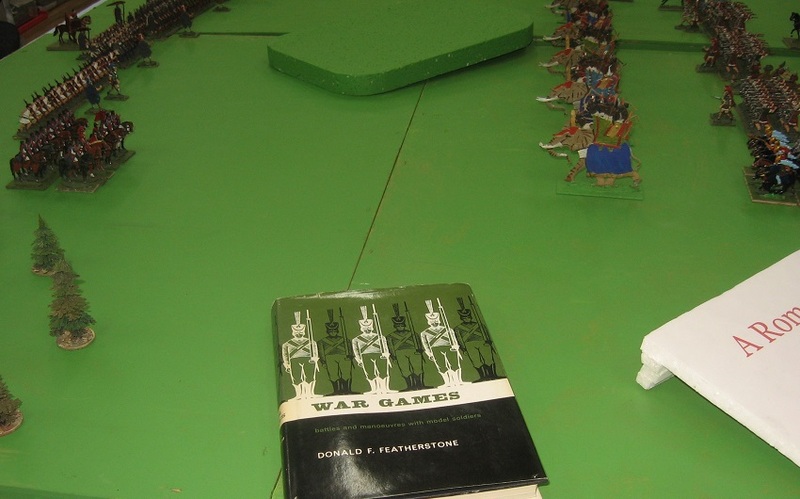 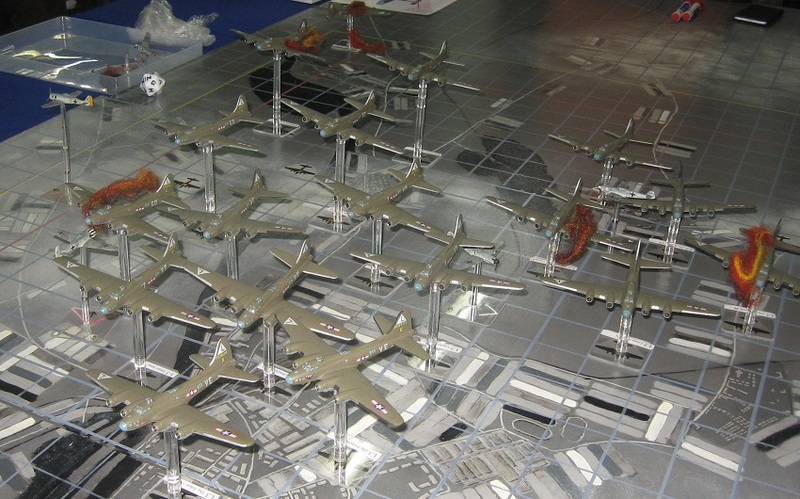 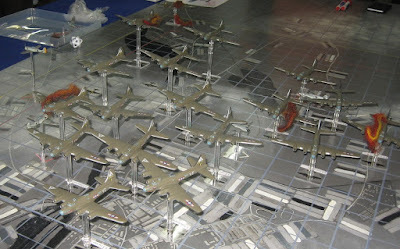 Of course, today's wargame plays using the base as the component - the figures sit on top and tell you what the base is and what it does. 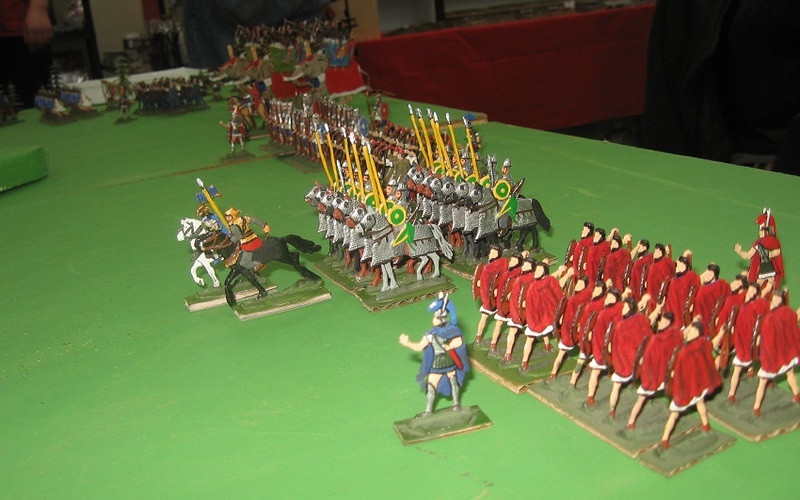 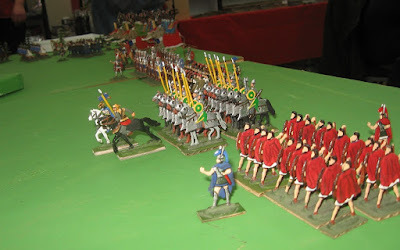 30mm flats (or indeed, in the case of the Bosworth game, 54mm solids) do just as good a job and have a unique, timeless, charm. 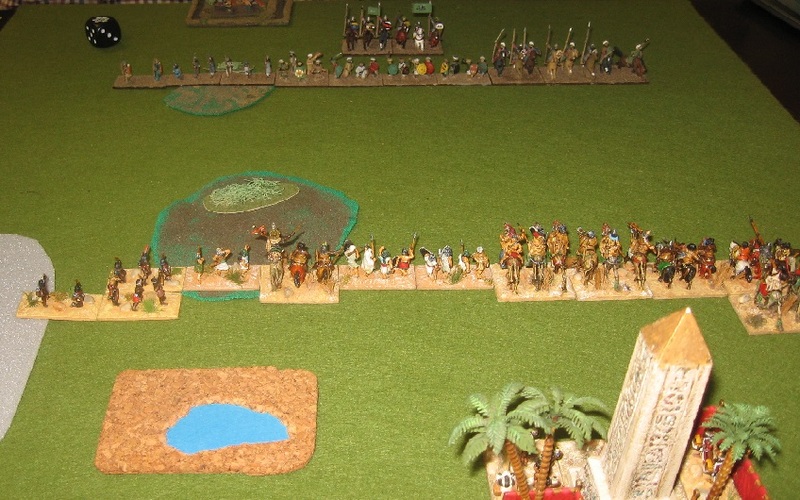 ... and then the players proceeded to destroy each other in the most monumental battle of attrition this scenario has yet produced. 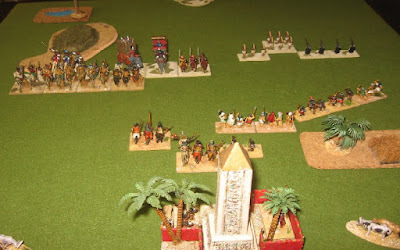 Actually not unlike the original battle as afra s we can reconstruct it with confidence. 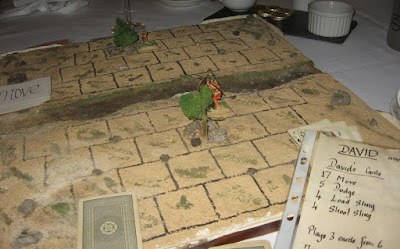 Although we were tight on time, we ran through twice, as, for the first time in hundreds of games (and not without a little player hubris), Henry got himself killed in the very first action of the game: jumping out of the trenches to deliver his Greyhounds speech and immediately shot dead by a crossbowman on the battlements. I guess the last thing he heard was my cautioning: don't assume you won't immediately be shot at ... (tailing off ... ) ... We reset the game. 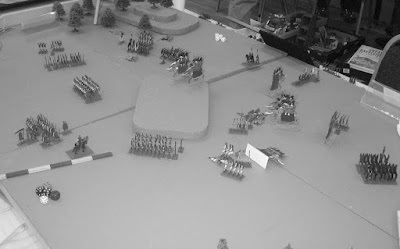 It wasn't to be his day, however ... and he was last seen battling into the town at the head of his men - as they fell around him, the Captain of the French garrison administered the coup de grace. 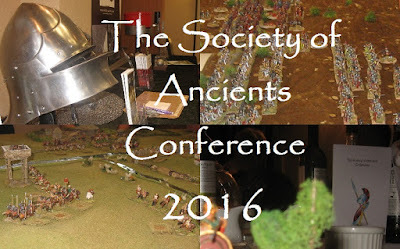 What a splendid event. 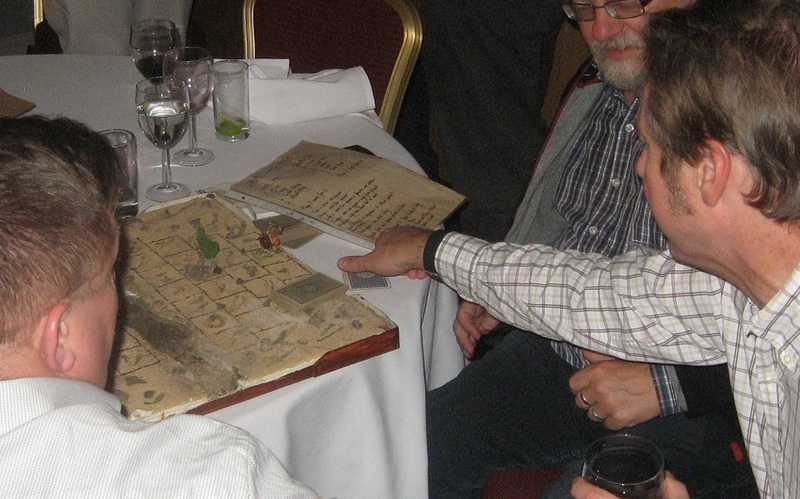 See Slingshot for details and don't forget to book for next year. 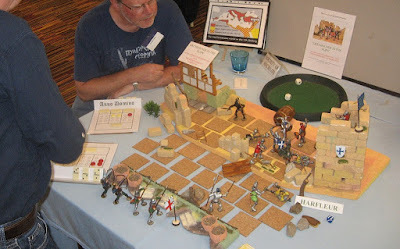 Great mix of old friends and new faces ... thanks to all the players ... thanks to Paul for an inspiring talk on Shakespeare's treatment of Roman politics, and to Matt for getting the Arsuf agenda up and running.